Working with Kristen was such a pleasure! I met her through an entrepreneur/blogger networking group. She totally got the vision that I had for my blog and brought it to life in a way that I just couldn’t do myself. This was my first time working with a graphic designer other than my husband and it was actually kind of fun! After a nearly ten year relationship and business partnership, I forgot what it’s like to just be a client and not also “the wife.” While I definitely respect my husband’s talents, it was really fun to get to explore my own vision completely with Kristen. Kristen was so sweet to spend time understanding my goals and vision. Working with her felt like talking to a friend I’d known for years! She really nailed exactly what I was going for with very few changes, which is something that I feel separates talented designers from others. I absolutely loved working with her! If you are looking for a designer for your small business or blog, I highly recommend her! You can get to know more about her below! You can expect to see lots of new and exciting content from me coming up soon! I’ve been working on a few new series that have been SO much FUN! Along with all of my mom and family favorites and some new giveaways, I will be introducing a new Home series that will cover organization, design, and more! Starting at the end of February, I will be sharing a new subscription box every week! Getting things in the mail is so much fun and they make great gifts all year long, so I am excited to hopefully introduce you guys to some new ones throughout this series. In another fun NEW series, I will combine my love for books with fun activities, crafts, and recipes for you to create with your kids in my Storytime series! Are you planning a trip this summer? Stay tuned because we are preparing for another cross country road trip with three kids and I’m going to share all of our secrets and fun along the way! I will also be bringing back my Entrepreneur Spotlights. One of my favorite things is to get to know the person and the story behind the business. I find it so inspiring to learn more about the journey of entrepreneurship through many different industries! And on that note, I thought I’d start with a fun interview with Kristen! I hope you enjoy and be sure to check out how you can get in touch with her at the end of this post! #Momlife: Baby and Kid Favorites, Tips, Tricks, and all things Family will be shared every Monday! Happy Home: My new Home series will include blog posts and videos about all things home: room tours, decor tips and tricks, home must-haves and more! Entrepreneurship: Entrepreneur Spotlight: Meet a NEW Entrepreneur and get to know the story and success behind their business through interviews. Find new inspiration and learn how you can follow your own dreams, too! I will also share helpful tips that will help you start or grow your own business! Subscription Box Series: Every week, I’ll be sharing new subscription boxes with you guys! You’ll get to see what’s inside the box and discover amazing new subscription boxes for yourself or for gift ideas! All types of boxes will be featured in this series! Storytime Saturday: On Saturdays, I’ll be sharing a storytime theme showcasing books, activities, crafts, and yummy recipes you can create with your kids! Other topics: I will always be looking for fun topics you guys will love! If there’s anything you’d like to see, let me know! I also have some plans to share more goals and productivity here since most of you are mompreneurs like me and can totally relate to the struggle of work/life balance. I can’t wait to share each new series with you! Videos: I will finally be uploading regular videos to my YouTube channel! We’ve been wanting to create videos for awhile and this will be a great opportunity to share family fun with our loved ones far away. We invite everyone to enjoy a little sneak peek into this adventure we call life! Videos will cover a variety of topics from Momlife to entrepreneurship. Some will include my kids since they love making videos. Some will just be for moms. I will also have regular subscription unboxing videos. Hopefully there will be something you find interesting….and if you do, I’d LOVE for you to subscribe to my channel! I am hoping to upload at least three times a week. Lindsay Satmary: When was your design business launched? Kristen Taylor: Biz Brand Studio officially launched in November, but it’s more of a relaunch/rebrand. I have been doing freelance web and graphic design since 1998 (plus a 2-year stint in a marketing department when we were stationed in Japan). Are you self-taught, or did you study design in college? KT: Completely self-taught. I have always enjoyed art, and back in high school even before I knew what a graphic designer was, I made and printed a poster-sized calendar – my first attempt at entrepreneurship! It was well-executed, but poorly marketed (apparently things didn’t change much in the intervening years!) When I met the layout artist for my aunt’s Homes and Land magazine and realized that she got to DESIGN beautiful things all day, I was hooked and told my parents I wanted to go to college for graphic arts. They were not convinced it was a good career path, however, and vetoed that idea. (In all fairness, they were paying a hefty chunk of my tuition.) Instead, I pursued a degree in International Relations and Mandarin Chinese, then after meeting my hubby-to-be, went on to join the US Navy as a Chinese linguist… It wasn’t until after I served 5 years in the Navy and got out to raise our first child that I stumbled across web design, and finally began to chase that dream. LS: What types of projects are your favorite to work on? KT: Brand identity design for mompreneurs! It goes well beyond just the design aspect… I delight in helping women develop the ideas they have into something great! And then design a complete package: logo (of course), alternate logos, a custom color palette, hand-selected fonts, and even a web site (if they desire) that communicates who they are, what they do, and who they most want to attract to their product or service… that is my passion – design that communicates the purpose and message of the brand owner. LS: Where do you find your best design inspirations? KT: I love cruising through Pinterest (who doesn’t!?) and Etsy, but my creations usually have nothing to do with what I’ve seen… I use those sites as more of an inspiration to CREATE something, rather than being the idea source of WHAT to create. Kind of like being inspired to bake when you see a luscious lemon cake, and then making a gorgeous dark chocolate layer cake with ganache glaze instead… You found inspiration for the activity, but funneled it into creating an entirely different outcome. LS: Describe your ideal client! My dreamie knows what she likes, but is super busy and blessed with more ideas than time. She wants a really polished, professional and *original* look that conveys WHO she is and what she does, but she doesn’t have the time/skills/interest to create it herself. Hopefully, she’s also quirky, fun, and kinda nerdy because that’s ME! And it’s ever so much more enjoyable to work with someone who really “gets” you! Besides, (let’s be honest) all my pop culture references would just be weird, otherwise! LS: What has been your absolute favorite project ever? LS: Did you recognize your passion for creating as an adult or was this passion also present during your childhood? LS: How do you balance your work and family life? Even though my hubby doesn’t understand what I do (or why), he is supportive. Our 15 y/o daughter is a budding artist (now SHE can draw! And paint, and sculpt!) and is very encouraging of what I do. My 13 y/o son is an absolute goofball, but super sweet and just happy I’m around all the time. They know as long as I’m not on a call, I am always available to them for homework help, to talk about their day, a funny story, or just a hug… I wouldn’t trade being home for them (even though they don’t NEED me at home anymore!) for the world. LS: What music have you been listening to lately? KT: I’m still stuck singing Christmas songs, but when I’m not out of season, I really enjoy pop… I know I’m not their demographic, but I really like a lot of the songs by Taylor Swift, Meghan Trainer (“All About that Base” <3), Imagine Dragons, Justin Timberlake, Fallout Boy. I also love tons of 80s and 90s music, Michael Buble (especially “Sway” and his entire Christmas album except for “Santa Buddy,” that one is just creepy! ), and of course the entire Mama Mia soundtrack (canNOT wait for the new movie this summer!). KT: Truly enjoyed? That’s a toss-up between “Pride and Prejudice” and the Harry Potter series… P&P has been a perennial favorite since high school (went from “Do I HAVE to read this! ?” to my most-loved book that I re-read almost every year). LS: Share a business milestone that you’re proud of! KT: My first $5,000 month! To be perfectly candid, it was the result of a couple of old invoices on top of a pretty big project, but it felt amazing to drop that check in the bank and inspires me to generate that much – or more – each month! LS: What are some business goals you have for 2018? 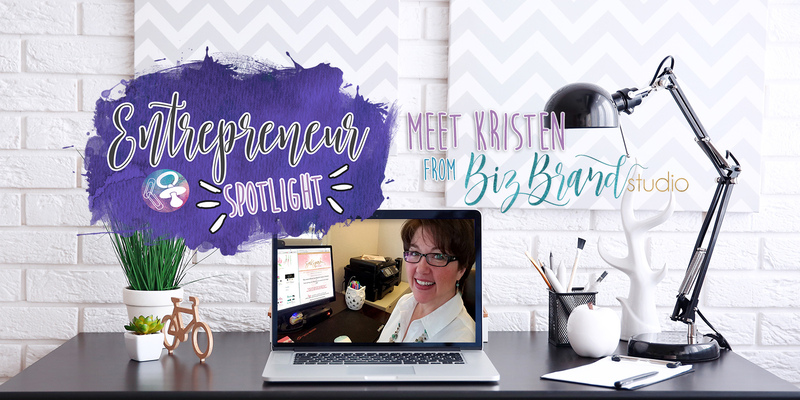 KT: So far, my business has been mostly one-at-a-time projects either past clients or referrals, so my goal is to shift over to primarily branding services so I can serve at least 20 mompreneurs each month doing the work that I love. Ideally, this would enable me to hire someone to take help with some of the more technical web site building tasks that don’t utilize my time as well or bring me as much joy. As a very shy (but friendly!) introvert, I have always struggled getting outside of my shell, even in small groups. So, I am very hopeful that the exposure from collaborating with Paperclips and Pacis will help this chicken little get in front of her peeps! KT: That is a tough question… if it could be anyone past or present, I’d say Leonardo Di Vinci. He came from nothing and became the quintessential Renaissance man. He was truly before his time in art, science, and technology. It would be fascinating to talk to him and learn where he came up with all of his crazy – and brilliant – ideas and contraptions. KT: It is essential to discover your “ikigai” which is the Japanese word for the concept of finding your true purpose. When you are able to identify the area in which what you love, what you’re great at, what is needed, and what you can earn a living at all intersect, it creates a sweet spot that reveals your true purpose. Ikigai is your reason for being that also brings immense satisfaction and success. For far too long, even though I love design, I didn’t value my own skills and considered them more of a “day job” while I chased every crazy idea that popped into my head (and we’re talking some serious crazy here!). Because of that, I didn’t excel like I could or should have if I’d searched deeper and accepted that my dream of being a designer was actually trying to guide me to serve others. One of the things that I strive to help my clients with is to recognize where their passions and skills align so they don’t waste their time, money, and even opportunities, like I did. LS: What advice would you share with anyone looking to hire a designer/brand strategist? KT: Before you even start looking (even though we’re constantly surrounded by inspiration), take some time to really think about what it is you do, who you want to serve, and why. It is too easy to be influenced by the design elements we see around us every day, but you don’t want those inspirations to be a distraction: “Oh, that soft pink and gold foil is so pretty!”; “Did you see that adorable new shop on Etsy?”; “The new Taylor Swift album looks so strong and moody.” If you allow others’ designs and messages to sway you, it will be a struggle to develop your own unique identify. At a minimum, it can bring on a case of comparisonitis, which we know can be crippling – and sometimes fatal – in the business space. As the saying goes, “You have to be YOU, everyone else is already taken.” Be willing to dig down and figure out the answers to your who/what/why, and you’ll find it much easier to eliminate design options that you admire but don’t adequately communicate your identity or message to your dream clients. KT: We were blessed to have lived in two of the most beautiful places: Hawaii, and Japan, and I’ve even visited Singapore, but I’ve never been to Europe. There is so much history and incredible art and architecture there that has influenced much of the western world, I think it would be an incredible adventure. Plus, both sides of my parents’ families are from European countries, so it would also be wonderful to trace back our family trees to their roots. I love to curl up on the couch and snuggle with our 2 adorable rescue mutts while I play a Scrabble-esque game on my phone (#iamawordnerd) or spend way too much time reading (but not commenting) on Facebook. I also do a LOT of cooking. My husband and I have been following a low-carb diet (we’ve each lost 75+ lbs in the last 8 months! ), so regular meal prep is a necessity, but I truly enjoy it. Most of what we eat is pretty normal fare (steak, grilled chicken, etc. ), but experimenting with keto-friendly recipes is always interesting… usually they’re edible, sometimes even great! But there have been more than a few mishaps that went straight in the garbage. KT: It has allowed me to stay at home with my kids, even long past them really needing me here. (So now it’s for the fur-kids!) I am an eternal optimist with a strong streak of realism, and have always been a big-picture “outside the box” kind of gal. Being an entrepreneur lets me pursue those ideas and try to build something great for myself while I help amazing women accomplish their dreams… I can’t think of a better or more fulfilling job. LS: What’s on your Christmas list next year? KT: We tend to be homebodies, so now that hubby and I are in much better shape (and will be even better by next Christmas), a family ski trip would be fabulous – and loooong overdue as it’s been at least 7 years since I last hit the slopes. As a gift, I would love a 3D printer… or a Source Forge. I have no real need for either, but they would be SO COOL and I just know I could create some amazing items with either gadget. LS: In what other areas of your life do your design skills shine bright? I’ve also done some home remodeling and furniture restoration, which go hand-in-hand with interior design, but are way more labor intensive. In all fairness, they also yield a bigger return (after refinishing a kitchen table and chair set I bought for $100 for, I sold it for $500), but you have to be prepared to do the work. LS: Where can people go to check out your work and hire you? KT: In addition to the new brand design I created for Lindsay here, you can see samples of my work and check out the customizable logos and brand packages I offer on my (not quite finished) site BizBrandStudio.com (I recently rebranded, too, and always put my clients before my own work). You might be wondering what a “customizable” logo/brand package is… Well, think of it like a custom home where the structure is built and now you get to choose the interior and exterior paint colors, countertops, flooring, hardware and appliance finishes, landscaping, etc., that make it uniquely YOUR custom home. I have created a selection of solid designs that would work for a wide range of businesses, and can be customized to use your name, preferred colors/textures, illustration, etc.. You can see in the examples that even similar logos look different when the name is changed and other colors/textures/illustrated elements are used. If you don’t see something that’s “practically perfect in every way” 😉 from my premade options, I also design completely custom logos, brands, and web sites, working with you one-on-one to build the brand of your dreams. The fully-custom designs will never be resold and you will have the intellectual property rights to them. Annnd if you use the code “LINDSAY20” at checkout, you’ll get 20% off any of our customizable design packages! “LINDSAY10” will discount any fully custom or web design packages by 10%. For more information, check out Kristen’s Website, and follow her on Facebook, Pinterest, and LinkedIn! Let Kristen know what you loved most about her interview or ask her a question in the comments!